Virginia Manor Clubhouse | Hubert Construction, LLC. 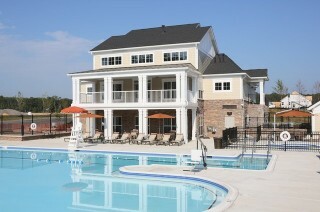 Hubert Construction has completed the construction of the clubhouse amenity at Virginia Manor for Woodlawn Development. The 6,400 SF two level wood frame structure features a lower level with a fitness facility and locker rooms which serve the pool constructed by NVBlu. The upper level includes a large entry with stone fireplace and community room each with two story ceilings, a warming kitchen, a management office and conference room. Hubert provided pre-construction design management and permitting services for our client, to expedite on site construction. Hubert Construction is the mid-atlantic’s pre-eminent builder of amenity facilities having constructed over 40 facilities valued at over $62 million since 2004.